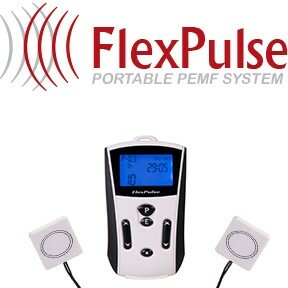 The FlexPulse PEMF device comes with 6 programs. These programs produce pulsed electromagnetic fields tuned to beneficial frequencies selected by experts. The programs run as per the timer and can also be set to be continuously running until the battery runs out. PEMF frequencies of each of our unique PEMF programs and their effects are described below. In a study (Amirifalah) of healthy women and a sham control group were given ELF-MF (intensity 200 μT) stimulation for 9 minutes. ELF-MF exposure frequencies were 10, 14, and 18 Hz, applied simultaneously to 2 brain areas at the top of the sides of the head (EEG settings C3 and C4) The effects were evaluated by electroencephalogram (EEG). The intent was to change the EEG for a therapeutic application, such as neurofeedback, by inducing a “resonance effect.” Local pulsed ELF-MF significantly decreases beta (15-25 Hz), sensorimotor rhythm (13-15 Hz), and theta (4-8 Hz) powers at a frequency of 10 Hz in C3 and C4 regions (12.0%-26.6%) after exposure (P < .05). The study indicates that PEMF stimulation to the top of the head at 10 Hz may be useful in the treatment of anxiety. 10 hertz stimulation has been studied by NASA on stem cells (Goodwin). With their particular 10 Hz signal, NASA discovered about a 400% increase in neural stem cells and turned on about 160 genes that control growth and regeneration. So, 10 Hz is a useful signal for tissue and cell regeneration. In addition, research in Germany (Wever ) found that 10 Hz stabilized circadian rhythms. Use of this frequency can restore jet lag and other sleep disturbances. Circadian rhythms control the hormone orchestra of the body and when they are out of alignment or not in their proper phase, many problems begin to show up in the body related to poor hormone function. Stress is a clear example of how circadian rhythms and brainwave frequency patterns can become disrupted. So, 10 Hz can be very useful for reducing many of the physical effects of stress as well as tissue regeneration. The muscles of the body have been found to oscillate at different ranges of frequencies, the most common being 10 Hz and 100 Hz. 10 Hz is the most common oscillation in the largest muscles of the body and the non-skeletal muscles, such as in the intestines and blood vessels. 100 Hz is more often seen in the white muscle of the body, such as in the upper extremities, shoulders and upper chest. There would be no harm in using 10 Hz or 100 Hz in muscles that do not typically have that respective frequency. Both of these frequencies are healing frequencies regardless. Program 2 alternates every minute between 10 Hz and 100 Hz. Most of the time, program 2 is going to be used on the muscular, tendon and ligament areas of the body. P1 would still end up being used more often to accelerate tissue healing, whether muscle or other tissue. And, our experience indicates that 10 Hz alone is better for pain management. When we are in very deep sleep we are typically in the Delta band or slow wave sleep. This occurs throughout the night, but is the most intense about an hour after falling asleep, lasting about an hour. It is the deepest sleep that we get into during the night. In this stage, the brain slows down dramatically to allow the body to facilitate healing and regeneration of the tissues. So, most healing work of the body during sleep happens in the Delta band. The 3 Hz program can be used before sleep to help people fall asleep or under the pillow, for a good part of the night or all night, to help maintain sleep. 3 Hz can also be very useful if people who are very anxious, agitated, angry or on the verge of developing panic reactions. Applying the coils across the head at the temples or just above each ear, under a headband or hat, usually for about 30 minutes, would help with these irritability situations. In addition, people with significant chronic pain who are very aggravated or irritated by their pain would benefit from program 3 especially. Other programs (P1, P4) can be useful for sleep as well, but P3, particularly at higher intensities, is more specific for the deepest levels of relaxation. 7.8 Hz is considered the Schumann resonance and is thought to be the basic or fundamental resonance of the atmosphere of the planet. The Schumann frequencies actually occupy the range of brainwave frequencies, but 7.83 Hz has been determined to be the statistical average of the environmental frequencies. 7.8 Hz also is in the theta brainwave frequency band. Most of our time spent in sleep during the night is in theta. Part of Theta sleep is dream sleep, which is only about one third of the total sleep time. The rest of the sleep time is non-dream sleep [non-REM sleep]. The relaxation produced by program 3 is much deeper than 7.8 Hz. However, 3 Hz sometimes makes people too relaxed or dopey, so 7.8 Hz would be the next choice. 7.8 Hz is also considered to be part of theta learning. Most infants and young children, while awake, are mostly in Theta. The brain in Theta is considered to be like a learning or data sponge. Theta allows massive amounts of information to be loaded into the brain. Many people report deep creative insights when stimulated by Theta frequencies. People in the creative arts use Theta states to break through mental blocks. If someone doesn’t know what frequency or program to use, it’s hard to make the wrong choice if P4 is selected, at least as a place to start. Professional or expert meditators are often in the Theta state. Because Theta frequencies are balancing to the body, they could be placed anywhere in the body. For learning, relaxation, or sleep benefits, the coils can be placed on the sides of the head in a headband or cap or under a pillow for treatment through the night. 23 Hz is in the Beta brainwave frequency band. This is considered the alertness frequency band. We are mostly in Beta during the day when we are mentally active and attentive. Beta stimulation improves mental function, and as a result, physical efficiency. People who have mid-day slumps have often shifted their brainwave frequencies out of Beta into increased Theta or Alpha. So, Beta stimulation across the brain in the middle of the day may make somebody much more perky. Beta can be very useful for people who are sluggish, have brain fog or are tired and even depressed. Beta stimulation can also be very useful for people driving long distances to reduce the fatigue and boredom factor with long-distance driving. Beta stimulation would also be good for people who are driving late at night, regardless of the distance, and who need to be alert for the trip. Coils in the P5 program can be placed over the solar plexus, upper chest or back of the head or neck for up to 30 minutes to achieve an alertness pickup. 23 Hz should not be used in somebody who is very irritable or anxious without caution, since beta stimulation may increase anxiety symptoms. The same can be said about pain syndromes creating significant irritability. One should probably never use Beta stimulation before bedtime. Recent research has found that square wave 1000 Hz stimulation to the brain was effective in treating acute depression, even in those on medical therapies. Medical therapies unfortunately can take several weeks to actually take effect. This is a very vulnerable time for many people. P6 (1000 Hz) was added to the FlexPulse to help to improve mood. While P5 could also be useful for this purpose, P6 would be recommended for those with recent onset of brief, reactive depression, or even more significant levels of depression, stress or mood change. 1 kHz (1000 Hz) square wave signal has been tested (Rohan) for the treatment of depression. The intensity of the device is about 20 G. The randomized, double blind, sham controlled study was in a large group of stably medicated, depressed patients with either bipolar disorder (BPD) (n = 41) or major depressive disorder (n = 22). Subjects received a single, 20-minute treatment. Change in mood was assessed immediately afterward using a visual analog scale (VAS), the 17-item Hamilton Depression Rating Scale (HDRS-17), and the Positive and Negative Affect Schedule scales. Substantial improvement (>10% of baseline) in mood was observed following LFMS treatment relative to sham treatment for both diagnostic subgroups, in the VAS and the HDRS-17. These differences were statistically significant across the two diagnostic groups (p = .01 VAS, p = .02 HDRS-17). Rapid improvement in mood was found using the Positive and Negative Affect Schedule scales (positive affect scale p = .02 BPD, p = .002 combined group). There appears to be a broad penetration of the magnetically-induced electric field throughout the cerebral cortex. They concluded by saying that low intensity PEMF stimulation may produce rapid changes in mood. P6 is not proven by any government authority as a formal depression therapy. Coil placements for P6 should be to the top of the head, side-by-side, typically under a hat or cap. Stimulation time could be anywhere from 10 to 30 minutes. with the management of any significant depression. The FlexPulse is designed to provide a variety of PEMF frequencies to accomplish different stimulation goals. The neurological recovery effects are based on understanding brainwave frequency patterns and physical recovery happens due to cellular repair and hormonal balancing effects of PEMF therapy. Delivered worldwide with 30-days return period & 2 year warranty. With a frequency range of 3 Hz to 1000 Hz, there is nothing like FlexPulse™ PEMF in the market today. It’s the best portable PEMF therapy device, designed for life-long use.